In the all new campaign ‘The Maltese Toucan’, you are drawn into a funky new adventure where a precious treasure needs to be protected against foreign agents at all costs. Spanning six missions you can expect manipulation, revolts and acts of sabotage as you use all the resources at your disposal to protect your island from outside powers trying to move in. Will your drink be ‘shaken or stirred’ in the end of this thrilling spy tale? 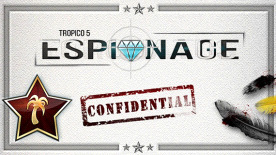 All new content plus the new spying mechanics are also available in existing Sandbox maps and in all multiplayer modes.